Hydroponic systems consist of the overhead structure creating a suitable climate for optimum plant growth and the irrigation system providing all the nutrients. Deciding on the greenhouse location is crucial. The structure (including the covering material) must create as close to optimum climate for the various crops to be grown. High radiation from the sun, high and low temperatures, hail (ice rain) are all factors that damage yields in some way or other. Think about the following fact; climate has the highest influence on plant growth. So the structure design elements and greenhouse location are crucial in the initial design phase of the farm. Because structures are so expensive, a lot of thought must go into the design, layout and location before building. There are two basic irrigation system designs; closed systems and open systems. The system itself is not so important as the structure, but it will determine what combination of crops you can grow. Unfortunately the topography of the land will also determine what system you will be able to use. So your greenhouse location of the farm is important. The decision to build a new greenhouse or expand present facilities should be accompanied by a thorough study of various aspects of where the construction will begin. There are four important considerations that should be taken into account before embarking on a capital-intensive venture such as this. 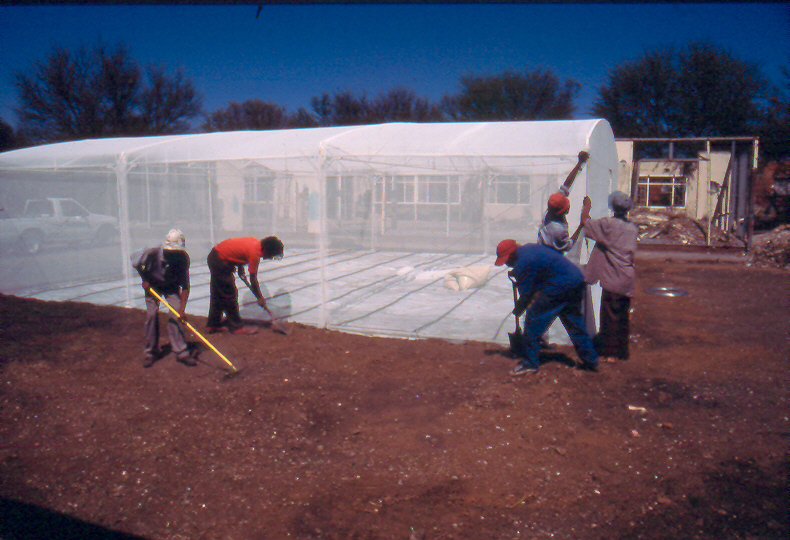 Climate has a major influence in the planning of the location of a greenhouse. Important factors such as available solar energy, maximum and minimum temperatures and their duration, hail and wind belts etc. Information on all of the forgoing questions allows the greenhouse manager to determine the degree to which he can maintain near optimum environmental conditions for plant growth. For most shade cloth houses one would try and select a piece of land which has a north facing slope so as to extract the maximum heat during colder periods. Another important consideration is the topography and soil type of the proposed building site. A building site of uniform gradient, with a slight slope is most desirable. If ground beds are to be considered using the existing soil, little or no grading should be accomplished unless there is assurance the remaining soil will be reasonable consistent in texture, structure and depth. Water drainage in the subsoil horizons is also very important. Many greenhouses have been built on land where poor drainage exists and there are continuous nutrient, disease and water problems. Many modern greenhouses require at least a 2% gradient along the length of the greenhouse. The new grower should consult the manufacturers of the greenhouses what gradient is required before grading. Topography plays an important part in the design of a closed hydroponic system. If the slope of the landscape is less the 1.5% it is not recommended to install a closed system. A bag culture system would be more advisable. Landscape with a slope of 1.5% or more will be suitable for both systems, however, the cost implications of levelling the land for the gullies should be taken into account. If the landscape has a slope of more than 8% (an estimate), a bag culture system is be recommended. Bag culture systems do not need as much land levelling and preparation as closed hydroponic systems. One of the merits of being able to build a new greenhouse facility is the opportunity to provide adequate growing-, work-, shipping – and storage space. Not all greenhouse complexes need the same type of facilities, but all need to be planned and laid out so expansion can occur easily and material handling systems employed.